3kW vs 5kW solar system: Which is a better investment? One of the first decisions a household considering solar will need to make is the capacity (in kilowatts, kW) of the system to be installed. 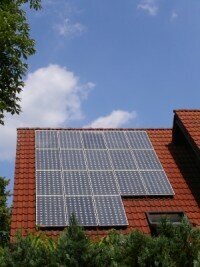 Two of the most popular residential solar PV system sizes in Australia are 3kW and 5kW. Which system size is the better investment – and why? These days, getting the most out of a solar PV system means using the energy directly in your home – ‘solar self-consumption‘. By putting the solar energy go good use within your home, you avoid the need to purchase electricity from the grid – at a rate between 18-35c per kilowatt-hour (kWh), depending on where you are (as per the table below). By contrast, exporting solar energy into the grid will earn you only about 6-8c/kWh. *Based on data from EnergyMadeEasy.gov.au and other relevant websites. It therefore follows that a smaller system will generally offer better value and returns than a larger one. In fact, this is the advice that Solar Choice and most reputable installers have been giving their customers since the last of Australia’s state-sponsored solar feed-in tariff programs closed a few years ago. The reasoning behind this is that it doesn’t make sense to pay more for a system whose energy you can’t make greater use of. An example of energy production from a 3kW solar system vs home energy consumption over the course of the day. The overlapping red/blue sections denote solar-self consumption, while the red only section denotes solar export. In this case, only a small amount of solar energy is exported. An example of energy production from a 5kW solar system vs home energy consumption over the course of the day. The overlapping red/blue sections denote solar-self consumption, while the red only section denotes solar export. While self-consumption is a bit greater than with the 3kW system in the example above, so is the amount of solar ‘wasted’ into the grid. One of the reasons that a 3kW solar system may is more attractive than a 5kW system is that the price will almost inevitably be lower for the 3kW system. 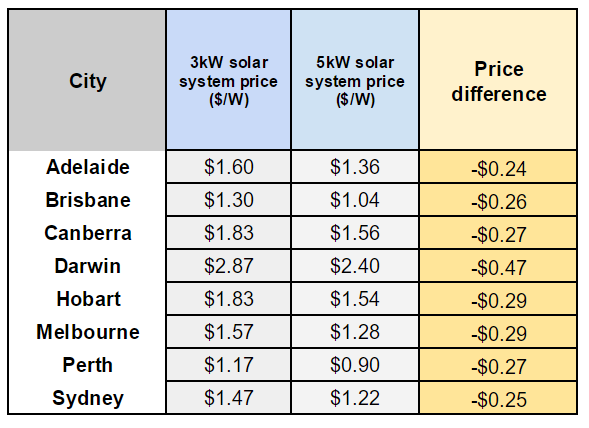 The table below shows the approximate difference between average prices for 3kW and 5kW solar systems in Australian capital cities. On average, a 5kW system costs about $2,000 more than a 3kW system. Even though 5kW systems have higher out-of-pocket costs, they also produce more energy. Often, the increase in price is disproportionately small compared to the increase in energy yields – which means greater value for money. 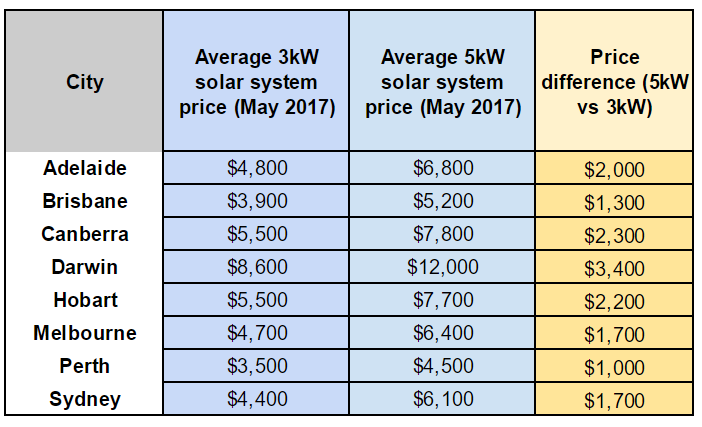 On a dollars-per-watt ($/W) basis, 5kW solar systems are cheaper than 3kW systems across the board – by about 28c/W (as per the table below). So let’s assume that you’re tossing up between a 3kW and a 5kW solar system. As per the table below, it turns out that the payback periods for both are often the same or similar – even taking into account the fact that you’ll probably use a smaller proportion of the energy produced by the 5kW system. This helps to explain why 5kW has come to be the average system size for Australia. Note that we’ve taken a conservative approach and assumed that you’ll use exactly the same kWh of energy in both the low and high self-consumption scenarios. In reality, you’d probably end up with a slightly higher self-consumption ratio than detailed below for the 5kW system because it will produce a bit more energy when you’re likely to use it. Results generated using Solar Choice’s Simple Solar PV System Payback Estimator, based on average system prices and going electricity rates for each city. Assumes the home uses 25kWh of energy per day averaged across the course of a year. Why opt for the larger system? At this point we’ve established that 3kW and 5kW solar systems can theoretically be equal in terms of their investment-worthiness, even though the larger system comes at a higher capital cost. The benefit of going with the smaller 3kW system would be conservation of your savings. What are the benefits of going with the larger 5kW system? Slightly more solar energy available when it’s needed most – Most households use the greatest amount of energy around breakfast and dinnertime. A larger system will generate more energy during these time periods. Room for future energy growth or changes – Having a larger system leaves you with a lot of wiggle room when it comes to the way you use energy. For example, if you plan on having children or on starting up a home office, you will almost certainly be able to start soaking up the excess sun power at some point in the future. I think you need to revist your Electricity consumption charge ($/kWh incl GST) in Victoria. No where near 18 cents inclusive of GST. And what about the service supply charge, and feed in tarrif. Why are those two not incorporated into the payback time. We’ll look into the issue with the consumption charge (which does indeed seem to be low). As for the feed-in tariff rates, they are incorporated into payback times (and keep in mind that this article was written before the Vic gov’s announcement that they’ll be raising feed-in rates). As for supply charge, we only include this in our calculations where we are comparing different energy plans (e.g. one retailer might have a higher rate than another) or when comparing being on-grid vs off-grid. Keep an eye out – will be updating this article soon. why has there not been any sun solar roof top tracking available? i know they are only available for ground mounted solar systems. you can gain 10-30% plus efficiency? i know it will be cursed by the wind, why cant you make one when there is high wind it goes flat and when its low or no wind it goes back to the tracking angle to the correct optimum efficiency facing angel to the sun. it would be much more cost effective and gain more power and pay it self off quicker also in the long run. i think it wont cost much more. also if its expensive to be made? i can make it my self iv got the skills in using powertools and im good in fabricating things from scratch. i just need details on how to make it and then supply it to the solar installer. our average cost on our house is $4 day with no ducted aircon off and then it goes upto $8 day when on, so want a system where it will cover all day time running and then add battery storage latter on for night use. is 7kw big enough or bigger is needed? also i think we got 3phase also because of the big AC unit i think its 10kw plus from meomory. and also i heard it better to overclock your inverter then to have less power going in to it, is that right? Lots of points to address here so I’ll break them down in chunks below. -Rooftop solar tracking doesn’t really make a ton of sense these days given how affordable solar panels have become. Instead of adding tracking (which introduces moving parts and the possibility of breakage), it’s usually easier and more cost-effective to simply tack on another panel or two to increase overall system output. If you’re keen and confident that you can make a tracking system yourself, don’t let us stop you though! -You can read about inverter overclocking here and here. Yes, it’s an officially recognised and widely used practice – and is probably a more cost-effective and trouble-free option than rooftop tracking. -Again, you can use the PV & Battery System Sizing & Payback Estimator (linked above) to work out rough payback times. If the solar & battery system are appropriately sized (and you don’t pay too much for it), then you should be able to get a payback period well under 10 years. We recommend going with a small battery system to start out with, as smaller systems are more likely to have a shorter payback period. Hope all this helps, and good luck with your project!